To meet the needs of today’s learners, the tradition of artisan teaching in solo‐practice classrooms will have to give way to a school culture in which teachers continuously develop their content knowledge and pedagogical skills through collaborative practice that is embedded in the daily fabric of their work. This report takes us one step further, summarizing the impacts of learning teams, particularly in science, technology, engineering, and mathematics (STEM) content areas, on teacher practice. Read the knowlege synthesis (PDF). What conditions promote or limit school and student success in science, technology, engineering, and mathematics (STEM)? What teaching practices are most effective? Find out in Successful K-12 STEM Education. Teachers and principals alike play key roles in improving education. That's why it's crucial for school districts to have in place effective systems for evaluating their performance. How do districts in California fare? 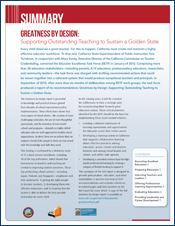 Read this brief, which analyzes data from a survey taken by more than 90 percent of the state's local education agencies. Making Sense of SCIENCE: Building Stronger Science Education Communities with Transformative Professional Learning and Needs-Based Technical AssistanceMaking Sense of SCIENCE empowers teachers, leaders, administrators, and all science educators with the knowledge and skills needed to engage learners and increase achievement in 21st century science classrooms and beyond. Math Pathways & Pitfalls Implementation Modules Institute: Boost K–8 Student Mathematics Understanding and AchievementIncrease K–8 students' — including English learners' — mathematical understanding and their ability to articulate that understanding. Participate in our institute. Aim for Algebra Institute: Implement Standards-Aligned Curriculum for Student SuccessMiddle school and high school teachers: Learn research-affirmed instructional techniques designed for student success in mathematics and that support implementation of the standards-aligned Aim for Algebra curriculum. Our on-site institute is tailored to your needs.